Bingo Hideout asks is My Free Bingo Money really free? So why do Bingo Hideout ask if My Free Bingo Money is free? Because as we were scouring the internet looking for all that is new and happening in the world of online bingo, we stumbled across ‘MyFreeBingoMoney’ on the home shopping channel website, Ideal World. The Ideal World shopping site features an offer for a 6 month membership for £30 (+ £2.99 P & P – ?) at the MyFreeBingoMoney site. The offer description states that players will receive free bingo credit of up to £55 per month which is equal to £330 for the six month membership. Ideal World also has a video commercial that sells all the plus points in which the presenter states that MyFreeBingoMoney offer all the best deals on the internet and that there are thousands of bingo games available for players to enjoy free. 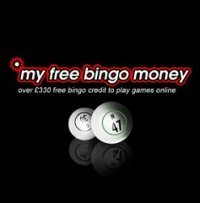 MyFreeBingoMoney states that it is a one stop internet shop offering free credit offers to play free bingo games online at over 40 bingo websites such as 888 Ladies, The Mirror Bingo and Game village Bingo. Well where is the catch? Well we can’t say because the only way to find out what the offer includes is to actually sign up and become a member. The guys in the Bingo Hideout office suspect this site is no more than a bingo sites directory that sends an email out to members highlighting all the latest free new member bingo bonuses that are available. Surely any site worth its salt would be more than happy to reveal more information about the Free bingo money available – and excuse us if we say that if bingo players have to pay £30 + £2.99 for this membership then the bingo does not seem to be free! It might be an idea for players to ask amongst their friends before parting with any cash if they are contemplating using this site. Because although on the surface £30 for the possibility of £330 of free bingo cash seems a great offer, if the offers are not genuine offers that any player can take advantage of then it might be in the end worthless. Worse still players could be paying for information on ‘special’ bingo offers when they could use free directories like Bingo Hideout to obtain the same information. Just checking a few of the examples on the Ideal World site, for example the free £15 from Wink Bingo, this is the same amount for any new account holder at Wink and so could possibly just be the standard offers that any new player can receive without joining the MyFreeBingoMoney site. Players can find out all the best bingo sites to play by visiting the different sections on the Bingo Hideout site, can sign up to receive newsletters, use the free Bingo Bonus Booster which will inform players of all the best free bingo bonuses out there, but best of all players can save their cash to actually use to play bingo on the sites that they wish to. Sorry of we are sceptical but as they say if it seems too good to be true then it probably is. However if the MyFreeBingoMoney team would like to be a little more visible or let us know what the offers are they provide we will be more than happy to have another look at it! Incidentally we have found one blog forum that has a message added from a blogger that states ‘What do punters get for their money? It appears the company behind it, myfreebingomoney.com, scours the Interweb searching for freebie bingo offers on behalf of people who can’t use Google and have more money than sense!’. We of course can’t comment on this but would like to hear from any Bingo Hideout readers who are members of MyFreeBingoMoney, as we would love to know more about this site.